DULLES, Va.Mar. 26, 2015-- Orbital ATK, Inc. (NYSE: OA) technologies played a crucial role in Wednesday s successful launch of a United Launch Alliance (ULA) Delta IV rocket from Cape Canaveral, Florida, and the on-orbit operation of a new Boeing GPS IIF satellite. The satellite will provide improved accuracy, signal strength and quality to America s warfighters, allies and civil users worldwide. Orbital ATK s contributions to the Delta IV and GPS IIF that launched March 26 include cutting-edge technologies from across the company. Photo courtesy of ULA. Orbital ATK s contributions to the Delta IV and GPS IIF include cutting-edge technologies from across the company. In addition to the state-of-the art solar arrays and other critical components on the GPS IIF satellite, contributions include the two Graphite Epoxy Motors-60 (GEM-60), large composite structures and the main engine nozzle. Orbital ATK s contributions to the Delta IV GPS IIF-9 mission are prime examples of the affordable, innovative and reliable products we offer, said Ron Grabe, President of Orbital ATK s Flight Systems Group. These products are crucial to our nation and millions of GPS users around the world. ULA s Delta family of launch vehicles has been lifting high-priority government and commercial payloads to orbit for more than 50 years. 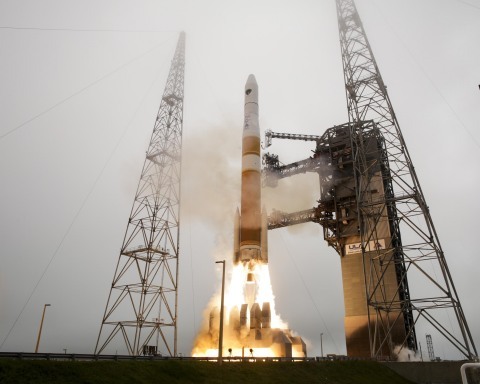 This launch marks the 371st Delta rocket since 1960 and the 29th Delta IV since 2002. It also marks the 69th GPS satellite launch and the 55th to use a Delta rocket. The Delta IV medium-plus rocket flew in a configuration featuring two Orbital ATK commercial GEM-60 solid rocket motors produced in Magna, Utah. These motors boast a flawless record and are the 43rd and 44th GEM-60s to fly. Their 90 seconds of flight time and 560,000 pounds of thrust boosted the 371st Delta vehicle into the sky. The nozzle for the launch vehicle s RS-68 engine was designed and manufactured at Orbital ATK s facility in Promontory, Utah. The nozzle design includes an Orbital ATK-developed thermal protection material that is capable of shielding the nozzle from the extreme heat of launch when external temperatures can exceed 4,000 degrees Fahrenheit. The GEM cases, manufactured using advanced wet winding techniques at Orbital ATK s Clearfield, Utah facility. The fairing, payload attach fitting and diaphragm, interstage, centerbody and thermal shield, all produced using advanced hand layup, machining and inspection techniques at Orbital ATK s Iuka, Mississippi facility. Orbital ATK s Goleta, California facility designed and manufactured the satellite solar arrays and a deployment boom. Orbital ATK has achieved 100 percent on-orbit success on all solar arrays and deployable systems delivered and launched to date. Orbital ATK s San Diego, California facility manufactured the composite solar array substrates. Orbital ATK s Commerce, California, facility had responsibility for the ullage tank assembly, including the blankets, heaters, thermistors and pressurant lines. This tank is a spherical vessel constructed of titanium. Orbital ATK s Beltsville, Maryland facility provided heat pipes for the GPS IIF equipment and radiator panels. Orbital ATK s Rancho Bernardo, California facility performed final assembly and RF (Radio Frequency) testing of the antenna suite for GPS IIF between 2003 and 2010. ULA will deliver two more GPS IIF satellites into orbit this year, and then another in early 2016 to complete the IIF series. These satellites will be delivered into medium-Earth orbits and will circle the globe every 12 hours, providing critical Navstar positioning, velocity, and timing assets fully functional until the next-generation GPS Block IIIA comes online in 2016. In addition to their civilian usage, the Block IIF satellites boast enhanced accuracy, reprogrammable processors, interference-free signals for commercial aviation, search and rescue capability, and a new Military code that is better resistant to electronic jamming.